Being a system administrator is never an easy job. You are messed up with so many things that you dont know whats currently going through. No doubt you make your system superb but you never care the way you work, be it food, sleep or your place. Today a small thing caught my eye. 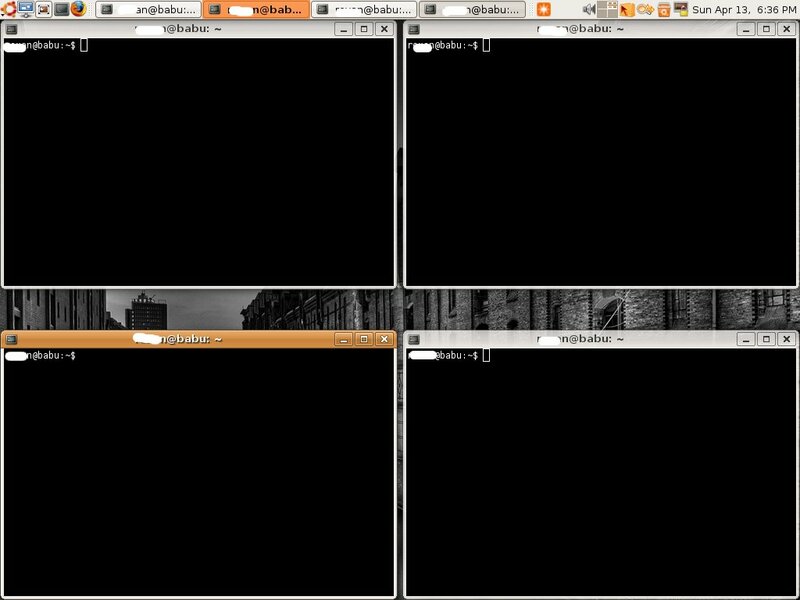 Usually if you see a linux user or admin's desktop they are all filled with terminals all messed up but yesterday I went to one of my friend and his terminals were arranged very nicely. See below. 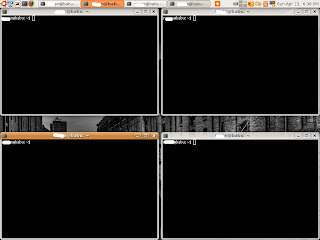 With a help of small script four gnome-terminal will tile up for you. With his permission I have copied the script here. # Please note that you may need to adjust 69x22 if the screen looks to big or small. This didn't work for me on Fedora 9. I did a simple copy and paste of the code that you have there, and while it did open four terminal windows, it did not set them to 70x21 nor did it tile them on my desktop. I'll work out the kinks, but I just wanted to let you know what my results are. Still a very nice idea, especially when you spend your time SSHing into multiple servers all day, like I do. Tabs are great, but being able to see everything on a single screen is much better. IF your resolution is different you have to change the 70X21 numbers to suit you. Anyways I also setup this as I had to ssh into various machine and see them all. Here is the code that I used to get it to work in Fedora 9. It looks like the --nomenubar option has been changed. Also, the window dimensions that I use are for a 1440x900 widescreen display. Ya you are right. This is my latest code.